Have you ever tried any of my recipes? I would love to hear from you the feedback. I have friends who give me the honest feedback. It helps me to enhance the recipes and apply updates if any to provide a better place for my readers to seek for trusted recipes. There are blogs we all follow for inspiration, photography, stories and trusted recipes. I always try to bookmark or pin the recipes that I trust which I will be making over and over for my family. It makes things easier to manage for me. If you trust any of my recipes, feel free to pin it on pinterest. Couple of weeks ago when I was driving back home after picking the kids from school, my daughter asked her usual question as we passed the local donut store 'Mommy can we have some donuts?" and I replied as usual 'Its not healthy, I will make some". I guess she was tired of this redundant answer and asked, "Mommy can we have something unhealthy sometimes?". I couldn't stop laughing. I knew that I had to make donuts for them one of these days and cannot procrastinate anymore. I knew what exactly I wanted to experiment. I had a jar of some fresh homemade pumpkin puree sitting in my refrigerator. I adapted and modified a recipe I came across at pinterest with the ingredients I had with me to make healthy version of donut holes. I couldn't believe that they came out super soft with only 2 tablespoons of oil. 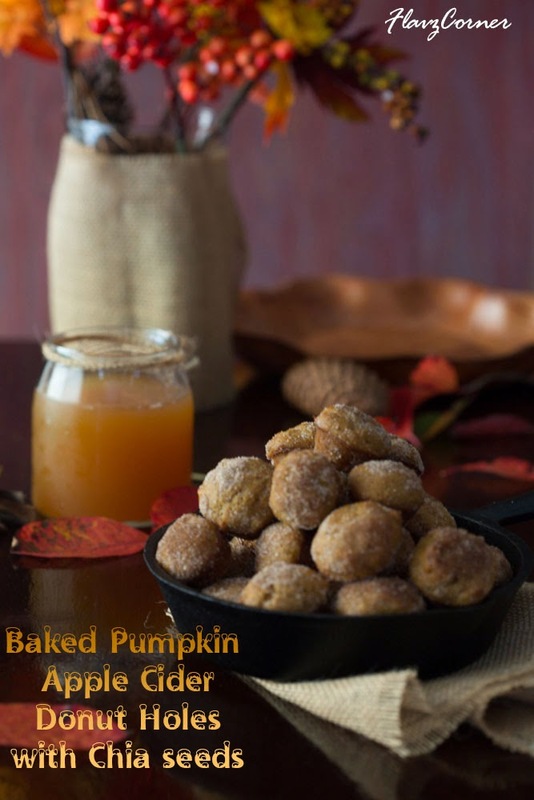 The pumpkin puree was the magic ingredient in this recipe which kept the donuts soft and moist even with the addition of whole wheat flour. I was totally impressed with the results. Lil Noah was munching on them each time as he passed the kitchen. Now I know that I can rely on this recipe to make some healthy donuts when kids ask for it. And I would like to share this healthy version of donuts with you so that you can make for your family too. Donuts need not to be treated as a unhealthy food anymore. Feel free to make these for your family when you crave for some donuts. Sift all the dry ingredients like all purpose flour, wheat flour, baking powder, salt and cinnamon once and keep it aside. Whisk the egg, brown sugar and pumpkin puree till well blended. Add yogurt, apple cider, vanilla extract, honey and oil and whisk till everything is mixed well. Now fold in the flour mixture to the wet mix and mix till there are no dry lumps. Don't over mix. Add the chia seeds to the batter. Keep the batter aside for 5-8 minutes before baking. Bake the donuts in mini muffin pan or donut molds for 10 -12 minutes depending upon the muffin tin or donut mold size or till a took pick comes out clean when tested. Transfer the donut holes to a wire rack to cool for 5 - 6 minutes. Mix the cinnamon and sugar in a plate. If using butter, dip the donuts in melted butter and roll in the sugar and cinnamon mix. Store in air tight container. Keep refrigerated if storing for more than 2 days. I made the pumpkin puree at home. I bought a small pumpkin. Cut them into half, scooped out the seeds. Baked in the oven at 400 for 20 minutes by wraping them in aluminum foil. You can also bake them without aluminum foil by placing the cut side down on a baking sheet. Once the pumpkin is cooked, scoop out the flesh and puree it in a chopper/ blender or food processor. Transfer them into clean jars and refrigerate or freeze them for future use. They are very handy. 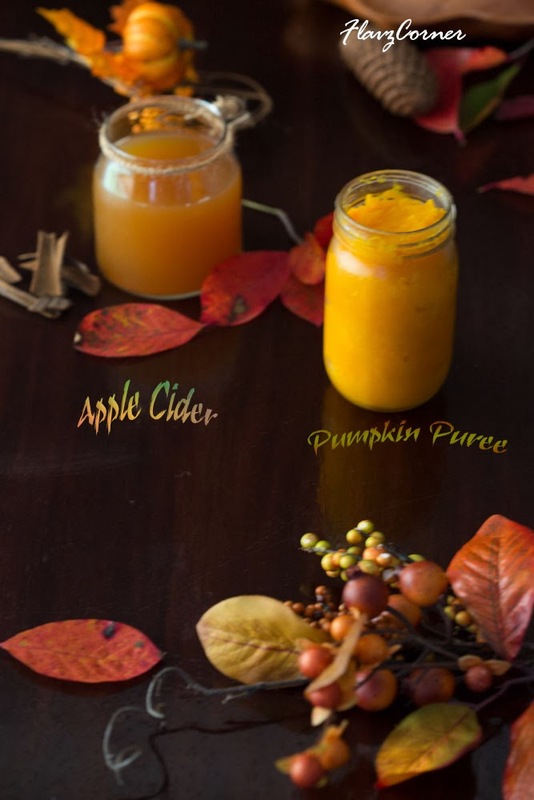 You can use canned pumpkin puree too, but trust me the homemade tastes much better. If you are using powdered sugar for dusting the muffins, let the muffin cool down completely before dusting. I didn't use butter at all, the muffins were still moist and the sugar cinnamon mix sticked on them perfectly. If you don't have apple cider, you can substitute it with apple juice. These sound fantastic!! I haven't made anything pumpkin yet this year, but this is making me want to!! My first time here...you have a beautiful blog space. 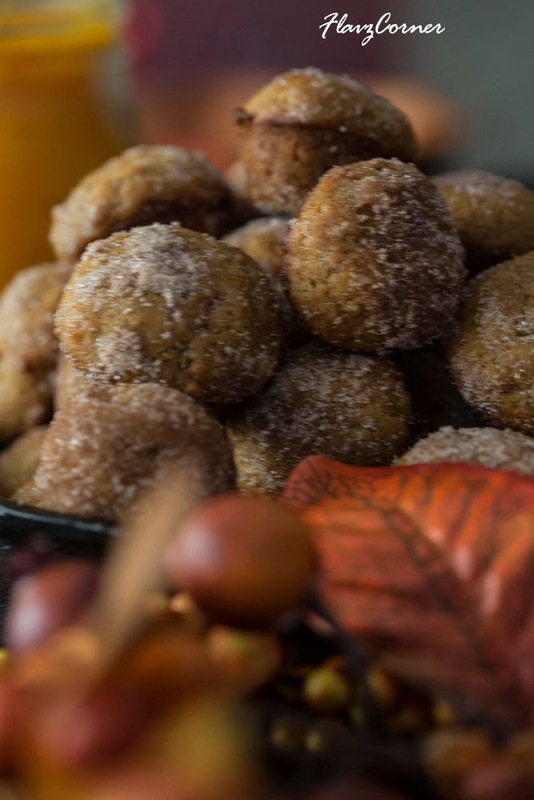 The donut holes look fantastic and your healthier version is something I look forward to trying soon. Thanks for visiting my blog!! Let me know how it turns out for you. We really like baked donuts (or donut holes!) too. I love the fried ones, but just can't do that very often. These looks terrific - such wonderful seasonal flavor. Thanks so much. Thanks John!! They are so moist that you don't even taste any difference from the fried ones. What gorgeous pictures, Shibi! 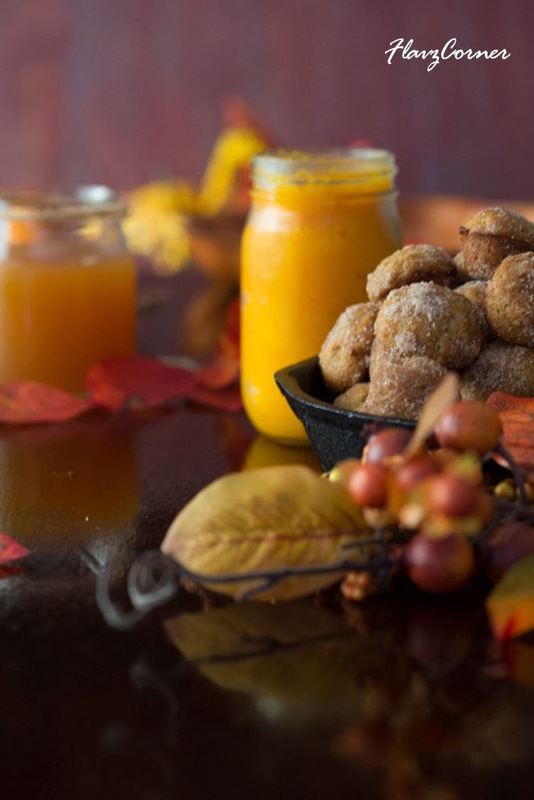 I love the combination of flavors in these donuts...They are indeed a great Fall treat! Beautiful!! All i'm thinking about now is donut holes! Yum! We love your recipes, they are so yummy. Would be delighted if you could share your recipes with us at http://ipinrecipes.com/ a community for food bloggers and food lovers. With iPinRecipes.com your recipes will be published immediately without any editorial review. No need to edit, crop your recipe images, with iPinRecipes.com you can directly pin your recipes from your blog. So why to wait, join our community and start pinning recipes. Just made a 1/2 batch of these, butter & cinnamon-sugar and all...deeelicious! Thanks for trying the recipe!!! I am glad you liked it.